Make preparation for necessary reference, e.g. Translation Memory, previous translation, client website, glossary etc. Create the project-specific glossary and get client approval. Select the best suitable resource including translation team and reviewing team for this specific field. The Project Managers monitor the projects during the whole process, and work with project team to ensure the project on time delivery. Their work scope includes but not limited to progress management, question submit, coordination with clients and teams, sampling checking etc. - To select the project team member very carefully is key to success. - Translators need to submit questions they are uncertain in time. - Reviewers are required to do 100% reviewing on the 1st round translation. - Reviewers will have chance to proofread the DTPed PDF. - Project Managers will do sampling checking before delivery. 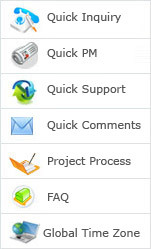 The PMs deliver the files on time based on delivery requirements.